Abby Gonzalez happily shows off her trout. Almost every outdoor publication that includes fishing will at some point have articles expressing concerns on the future of fishing for the next generations. Most tend to focus on the crop of fish that may or may not be available, adverse environmental changes and future regulations that could discourage fishing. While there is no doubt that those are viable concerns needing to be addressed, my biggest concern is getting kids involved in fishing. While I do not have any statistics to support my observations, my experiences show that today there are a lot fewer kids involved in fishing. 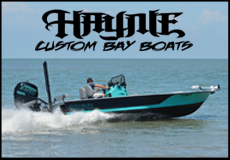 Each angler that considers himself or herself to be an avid fisherman likely had the roots of their passion developed at an early age and usually have someone in the past to acknowledge as being a major influence on generating their passion for fishing and teaching them the basics. 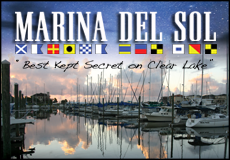 I recall as a young child how much I enjoyed going to Clear Lake and fishing from the numerous docks and piers along the lake and from the Harris County Park on NASA Road 1. My dad, while not very interested in fishing or crabbing, would take me and watch while I fished. Much of my early knowledge of the basics, from how to rig a pan fish line to the proper baits, were learned from others fishing around me. I don’t recall anyone ever getting annoyed by the questions I would ask and at times requesting to borrow a piece of bait they were using. The only fishing my dad had been exposed to was freshwater and mostly from river forks such as those along the Trinity River in North Texas. The only thing he knew about fishing was centered on a cane pole, bobber and worms or pieces of entrails of chickens. At some time near the age of eight a fellow angler on the pier at the county park offered me a few pieces of dead shrimp and showed me how to rig a pan fish line. Using that bait I caught a few small croaker, however, to hear me tell it, they were big fish. One person I will always remember is a neighbor who took my dad and me out in his boat. Launching at Bub’s Fish Camp near the old Seabrook-Kemah Bridge we headed out in a 15-foot Elgin (Sears) boat powered by a 12-hp Sea King engine. The neighbor first used his shrimp trawl to get bait, both live shrimp and small fin fish. 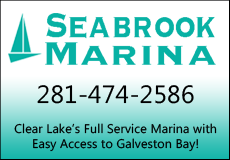 After obtaining our bait we pushed on to the bulkheads near the Houston Ship Channel and anchored around other boats. 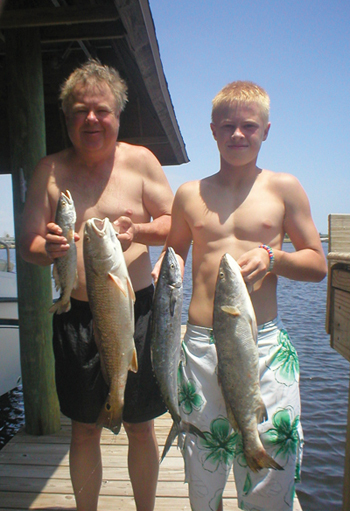 Mickey and Jordan Miller with a mixed bag of trout, redfish and mackerel. Wow, I will never forget that trip with all of the sand trout, croaker, gafftop and I’m sure other fish that we caught. From that day on I was hooked and it was just before my 10th birthday. Having memories like that and seeing so many kids being deprived of this fun sport caused me to go on a campaign to encourage other anglers to take kids fishing. With school now out for the summer, what a perfect opportunity to share this fun sport with our youth. Just about every opportunity that arises to take young ones with us fishing, my wife and I jump on it. 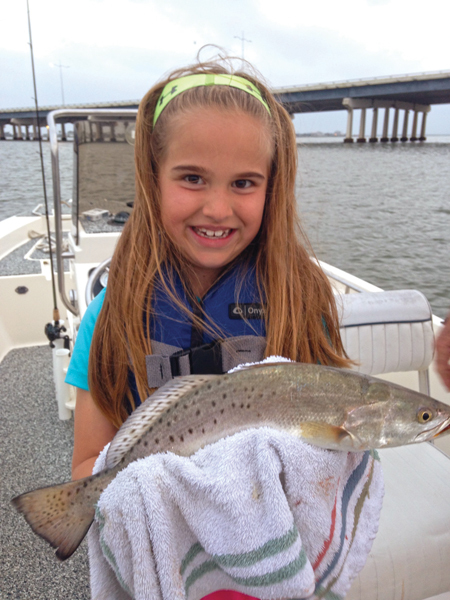 As a fishing guide I gave a substantial discount for father-child trips and many of the trips were father- daughter. The first time we hosted some kids was from the Harris County Youth Detention Center located across from the Harris County Park on NASA Rd. 1. That was back in the mid-1970s and the two youngsters that accompanied us had a ball. 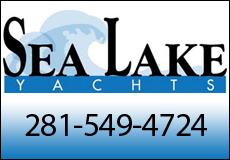 If you do not own or have access to a boat, there are many places to fish from shore, unfortunately not as many as in the past. Taking a youth fishing is a rewarding experience and will pay dividends for the sport when the child reaches adulthood.